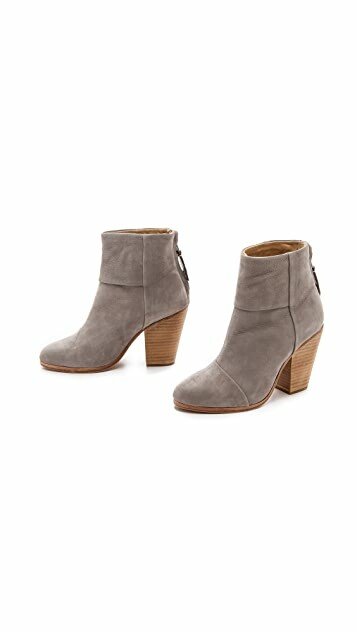 Artful seaming contours these nubuck Rag & Bone booties perfectly to the foot. The rounded toe is seamed at one side, and the paneled shaft is finished with a hidden zip at the back. Stacked leather heel and leather sole. I was very much looking forward to these boots as a new "go to" instead of my isabel marant "dickies" but was totally let down. Against my better judgment, i bought these knowing they are made in china. These run bigger than euro-sizing they are labeled. I didn't even need to unzip them to get my foot in. Exchanged them for 1/2 size smaller and they fit better. They are completely uncomfortable after 2 hours. I brought them on vacation, thus had to wear and keep them. Quality: upon inspection, they were unevenly "glued" i at some junctures. The one great thing about these is the color. perfect match to what i was seeking. I love rag and bone. Own about 23 pairs of their jeans and a plethora of their clothes but will never purchase their shoes again. I own way too many pairs! Enough said! What's not to love? One thing I noticed with these and that they were definitely true to size. I love the dove grey. Grey colour is prefect for wearing boots without that 'heavy' look. Love them - my second pair and I would get a third if it didn't seem too much. They are definitely much more comfortable after a couple of wears - likely more my feet getting used to the height (I love flats), but also the stiffness of the sole softens. Leather, as always, is buttery soft. These boots are gorgeous and oh so comfortable! LOVE! I have been wanting these boots for so long and finally caved and ordered the Camel Suede. The suede is soft and beautiful and they fit TTS. They are also so comfortable, I can wear them to work being on my feet all day. They are the perfect color for spring and I am SO happy I bought them. Definitely a spring staple in my closet. In any other brand of shoes I have tried on, I wear a 9.5 or 10. Even without socks, I need a 41 in Harrow booties. 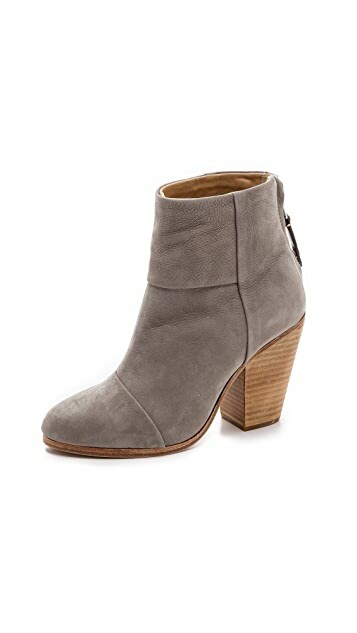 I have tried on Newbury booties in the past and the sizing seems to differ between materials. I have tried on the black leather version, which fit in a size 40. A size 40 in navy suede was too small. I ordered a size 41 in these which is a bit roomy but will work with or without socks. I would suggest ordering up at least 1/2 a size. Sized up half a size from my regular. I could run a half marathon these boots are so comfortable. Great purchase I don't regret in the slightest. I usually take a 7.5 or an 8 in most shoes, and I have wide feet and a high arch. I wear a 38 in R & B Newburys (and in R & B Durham boots) and these were no exception. The heels are high, but they're very stable and surprisingly comfortable - I can walk around in them all day without any discomfort. The leather on these shoes is just gorgeous! Perfect. This is my first pair of booties and I love them! They are great for day or night. Color and style are right on!! !